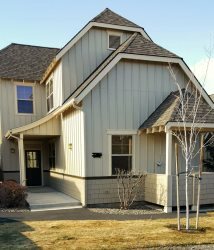 Plan a getaway or family vacation to this three-bedroom Eagle Crest getaway on the gorgeous Deschutes river! The two-story home is ideal for active families, fun getaways and even a quiet retreat. With a private hot tub and dog friendly, this home is ready to be your favorite! Spend quality together time in the living room by the gas fireplace. The full kitchen is well equipped for snack prep or a gourmet meal. The dining room boasts space for dinner parties and game night fun! At night, three bedrooms sleep guests comfortably with a king, a queen, and two twin beds. Take advantage of the queen sleeper for additional guests. Feel the world melt away in your hot tub on the private deck. Catch some rays while soaking up the 300+ days of sunshine on a lounge chair. Or fire up the gas grill for a tasty bbq and dine on the patio while listening to the river. Other amenities include a private washer/dryer for quick clean up after that hike. You have central air conditioning, WiFi, cable TV, and a DVD player here also. Two dogs are welcome with a small pet fee. On the resort there are three pool areas, two fitness centers, horseback riding, three golf courses, and lots of bike and hiking trails! Bend and Sisters shopping and attractions are a short 15 mile drive in either direction. When winter skiiing beckons- Mt. Bachelor is a short car or resort shuttle ride away. Hoo Doo Ski Area is a scenic 35 minute drive to “Steeper, Deeper and Cheaper” as us locals fondly refer to it.